This is the luxury version of cream of tomato soup. 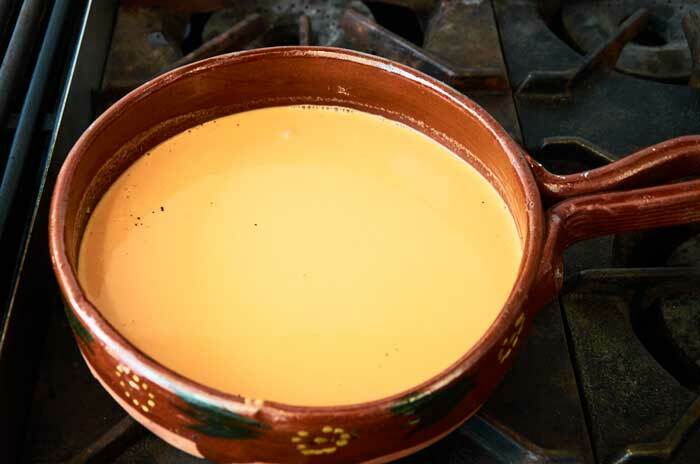 It’s made with lots of Mexican cream which thickens the soup and adds richness. Enjoy it as a comforting treat. If you enjoy a good cream soup you will love our cream of corn and cream of cilantro soups. These too are made with super rich Mexican cream. 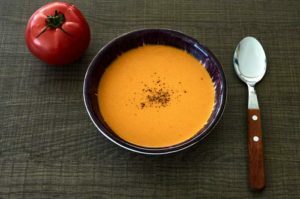 Mexican cream of tomato soup is prepared with only a few ingredients: tomatoes, onion, garlic, Mexican cream and chicken broth. The redder, riper your tomatoes are the better your soup will be. The typical hard semi-ripe tomatoes you find in the grocery store just won’t work well. 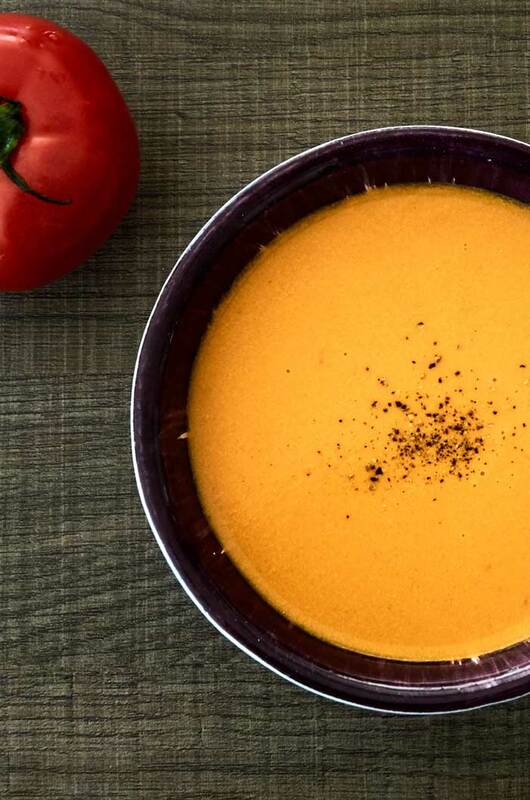 If you can’t find right tomatoes wait until you can before you prepare this soup. 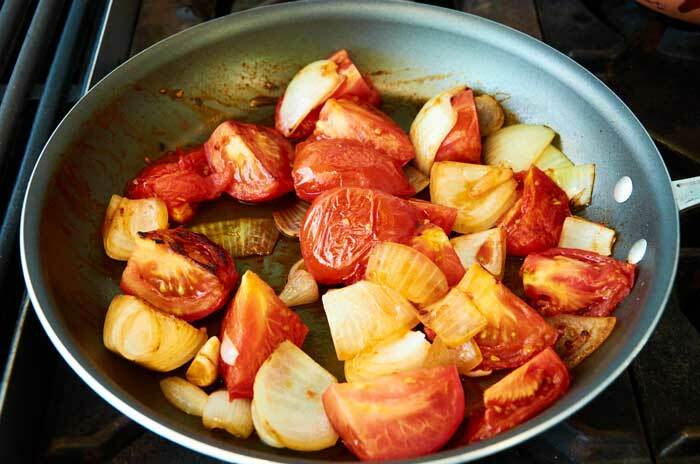 Roughly chop the tomatoes, onions, and garlic and fry in 2 tablespoons of oil. Cook until the onions and tomatoes are starting to brown. Browning the tomatoes and onions builds flavor. 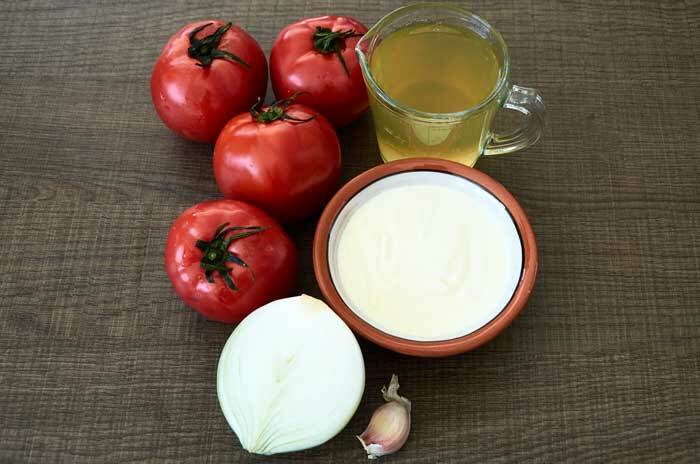 Blend the tomatoes, onion, and garlic with 2 cups of water. It’s best to blend in 2 batches. 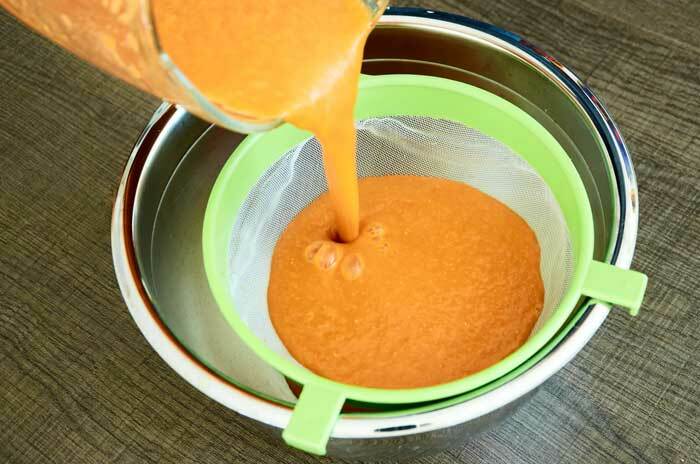 Straining is an important step needed to get a silky smooth soup. If you don’t strain it your soup will have bits of tomato seed and pulp in it which isn’t all that pleasant. When you are straining the mixture press down on the pulp with the back of a spoon to extract all of the good tomato flavor. Discard the pulp once you have extracted all of the liquid. You need to gently incorporate the blended and strained tomato base into the cream. Allow the cream to come to room temperature and allow the blended soup base to cool for 10 minutes before adding to the cream. 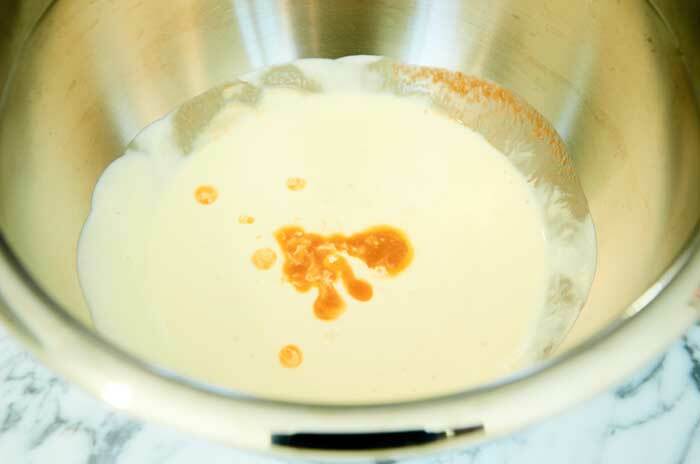 You need to introduce the base very slowly into the cream so that it doesn’t form lumps. 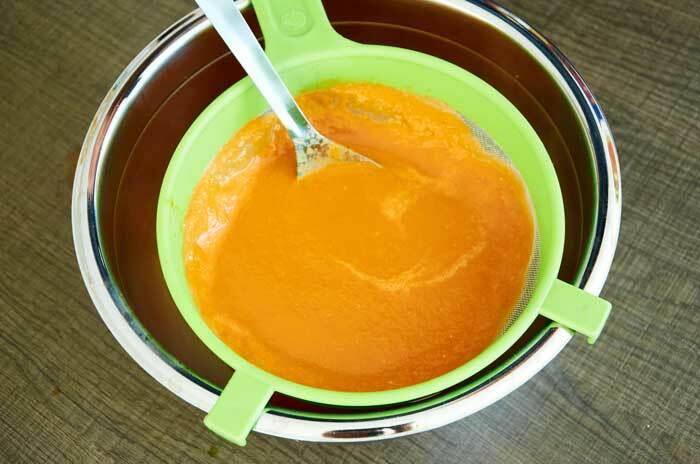 This step is important to get a really smooth soup. Put the cream into a large mixing bowl. Add a few tablespoon of the pureed tomato base. 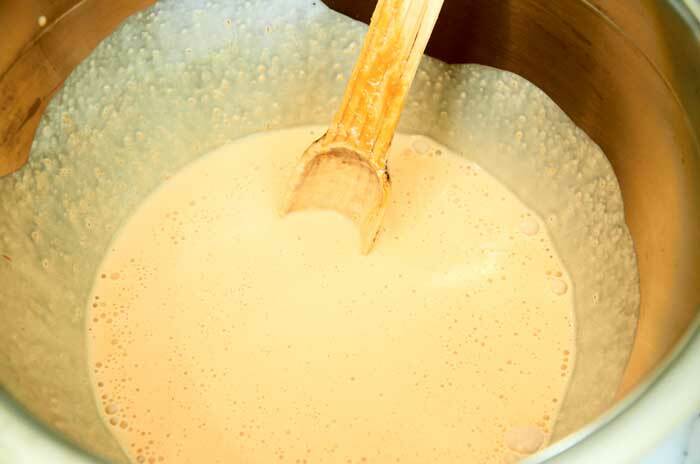 Stir to blend base into the cream. Add a few more tablespoons of soup base at a time and stir until all of the base has been incorporated into the cream. Now add 2 cups of room temperature water and stir for 30 seconds until the mixture is very smooth. Gently warm 1 cup of chicken broth and then slowly pour in the tomato soup mixture. Stir well until the chicken broth is fully mixed in. Bring the soup to a gentle simmer and then simmer for 20 minutes until the soup has thickened. Do not allow the soup to boil or the cream will start to clump. Serve immediately. If for some reason your soup has lumps in it, no worries. Strain just before serving and it will be perfect. Serve each bowl with a crack of black pepper. This soup is best served in smaller portions. It’s very, very rich. You might think you can’t have too much of a good thing but in this case, you can. It’s better to finish your soup wanting more instead of thinking why did I do that. Eating too much of this soup will give you the same feeling as when you eat an entire carton of ice cream in one sitting. Mexican cream of tomato soup prepared with vine-ripened tomatoes and thickened with luxurious Mexican cream. This is a soup for a special meal. Cook until the onions and tomatoes are starting to brown. 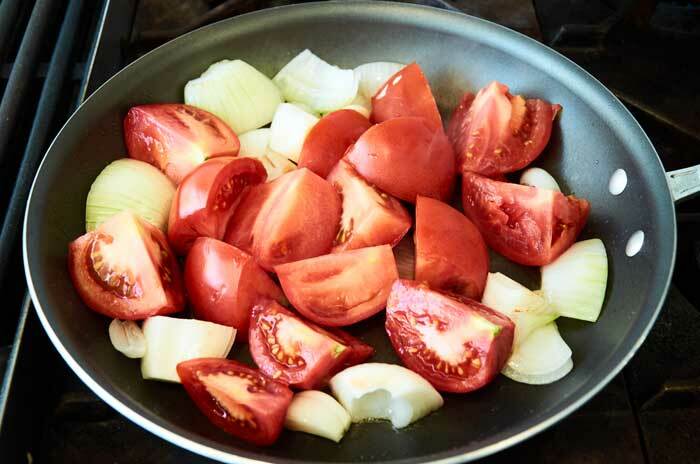 Blend the tomatoes, onion, and garlic with 2 cups of water. Strain the blended tomato mixture pressing well on the pulp to extract maximum flavor. Bring the soup to a gentle simmer and then simmer for 20 minutes until the soup has thickened. Do not allow the soup to boil or the cream will start to clump. If needed strain your soup to remove any lumps that may have formed. Serve each bowl with a crack of black pepper. You can substitute the chicken broth for 1/2 tsp of powdered chicken bouillon dissolved in warm water. Recipe sounds brilliant. Before I make it, though: is “Mexican cream” different than heavy (or whipping) cream? It’s just high-fat dairy cream, correct? 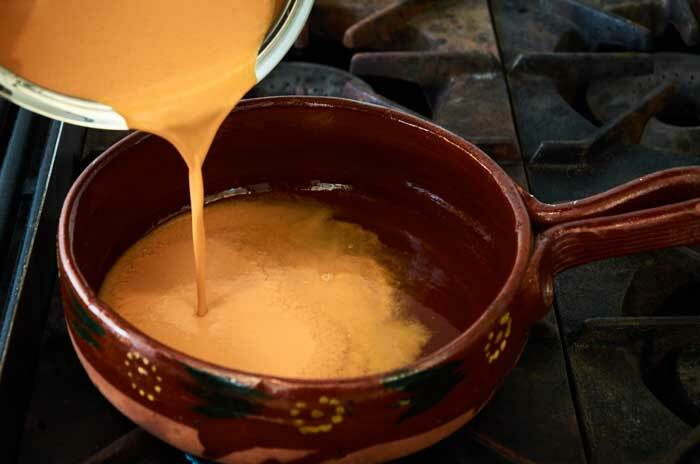 Mexican cream is a high-fat dairy cream. You can substitute heavy or whipping cream with good results. Don’t use sour cream though. Cheers! Looks really good! But should there be some ground cumin, cilantro or some chili powder to give the Mexican spicy taste? And also, do you add salt?